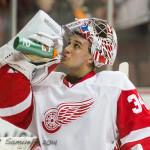 Ben Bishop pitched a 34-save shutout to finish off the Red Wings in Game 5 in Thursday night’s 1-0 victory. Bishop stood tall as the Red Wings tried to stave off elimination, and helped kill off a Detroit powerplay in the game’s final minute. The 29-year-old has been on-point in the post-season, allowing two goals in each game until Game 5. The Bolts now await the Panthers-Islanders winner for their Round 2 matchup. It is no secret why the Detroit Red Wings were eliminated. They have no answer for Tampa Bay’s top line. Tyler Johnson, Alex Killorn and Nikita Kucherov combined to score 10 of the Lightning’s 12 goals in the series. Killorn scored the game-winning goal in Game 1 and clinched the series with the only goal of Game 5, with 1:43 remaining in the third period. This couple with understanding goaltending was enough for to advance. The obvious concern for Tampa Bay moving forward is getting production from other places in the lineup. Make life harder for the Tyler Johnson, Alex Killorn and Nikita Kucherov line.